ATLANTA — While Atlanta may have a small population, it boasts a pair of giant tourist attractions — Route 66 and a 19-foot-tall statue that looms over it. More than a dozen volunteers came from Illinois and beyond Saturday to wash and paint Atlanta’s Bunyon’s Statue — a giant man holding a hot dog — to ensure it remains a Route 66 icon for years to come. Similar statues were once popular and designed to attract people to businesses. Atlanta’s giant originally stood for 38 years on Route 66 in Cicero, drawing customers to Bunyon’s restaurant. When it closed in 1993, the restaurant’s owners loaned the legendary figure to Atlanta, where it draws tourists to the town of nearly 1,700. While the one-of-a-kind Route 66 icon draws smiles and laughter from visitors, he’s a “serious factor” when it comes to economic development. The statue draws thousands from all over the world each year, said Atlanta business owner Bill Thomas, who helped bring the attraction to the city. 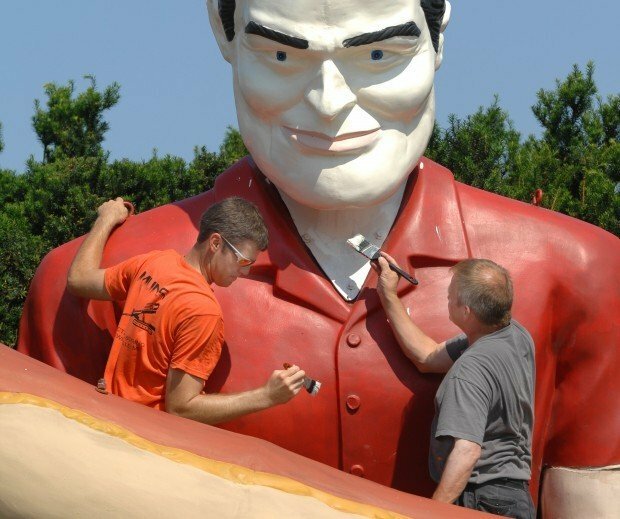 “There’s no where else in the world you can have your photo taken with a 19-foot man holding a hot dog,” Thomas said. Thomas was at the statue talking with a three-man film crew Friday afternoon when two carloads of people stopped to have their photo snapped. “That happens time and time again,” Thomas said. And it’s not just people from the Midwest. Saturday morning, as volunteers refurbished the statue, two visitors from Odernheim, Germany, stopped on their way from Chicago to Los Angeles. “It’s history and was a dream,” said Klaus Dreesbach of why he decided two years ago to plan the motorcycle trip on Route 66. Dreesbach and friend Rolf Mau weren’t surprised to see the fiberglass giant. The opportunity to help preserve the giant also drew enthusiasts from as far away as Iowa and Michigan. “I’m impressed by what people want to do to help,” said John Weiss, chair of the preservation committee of the Route 66 Association of Illinois and organizer of the work day. Those who are interested in getting involved can visit www.il66assoc.org for more information. “It’s my wife’s birthday and it’s what she wanted,” said Joe Foster, who traveled from Urbandale, Iowa, with wife, Kara, and daughter, Ella Hendricks, 8. “Route 66 is my passion, and he’s grown to like it,” said Kara, who painted one of the statue’s arms and the mustard on the hot dog. Bill Kelley, who grew up hearing stories of Route 66 from his parents, came from Eastpointe, Mich., to help. “Disneyworld and Vegas aren’t for everybody,” said Kelley of his passion for Route 66. Lived in Central Illinois all my life and never new it was there. (cont'd) perhaps our last as a young family unit. It's nice that our kids get a taste of nostalgic America. Thank you Atlanta and 66 association.